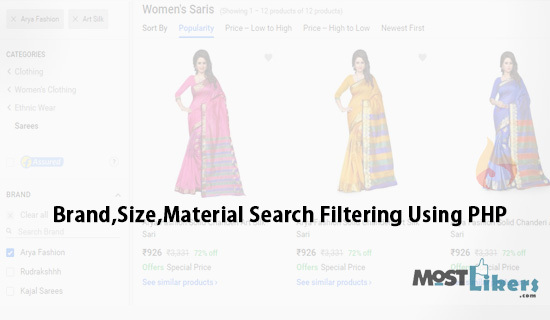 Recently I have posted Product Search Filtering Using PHP and MySQLi. It's a basic level of product search filter, Later I got a so many request tutorials, a message regarding Product, Brand, Size checkbox Ajax search like amazon, Flipkart search filter. Here I have created similar like sort, search filter. Let see deep discussions on this tutorial. In this tutorial, I have used jquery script for form submit. All the size and brand fetching through the database. create a product table with the column. insert some product information like brand, size etc.. Create a new page, Connect your database. Here I have created SQL, HTML layout everything on the same page(index.php). SQL WHERE IN - For size, brand, material value filter I have used WHERE IN SQL statement. it will check the array key value. in_array - It will check $_GET key value exist or not. Here I have used set select check box value. Just uploaded the files and ran the sql and all the results come back blank, the filters are blank too, is there something wrong with the php in index.php? बहुत बढ़िया माराज. मजो आगो जालिम. Hi! Thank you so much for sharing. I will give it a try next week. I am a able to use your source code for my coursework? halo brother, i think the select opti0n if demo run. in the select preference always selected "PRICE: HIGH TO LOW"
hello bro infinite scroll is not working in mobile.